In a tearful Tuesday interview with CNN in Lyon, France — where Interpol is headquartered — Grace Meng said her husband is the victim of political “persecution,” and voiced grave concern for his safety. In multiple statements and interviews, she has understandably focused on her family’s suffering. She told CNN how scared she felt for herself and the couple’s twin boys as she continued to receive threatening messages from strangers. But while few would doubt her genuine feelings for her husband and family, many observers believe Grace Meng is politically savvier than she might seem — and that her high-profile response to her husband’s vanishing and detention is driven by a carefully laid-out strategy. Given his powerful role since 2004 as a vice minister of public security, many activists say Meng Hongwei would be no stranger to “forced disappearance” and other brutal tactics used against enemies of the state. Grace Meng reported her husband missing to the French authorities last Thursday, after she received a terse message from him in China saying to “wait for my call,” followed by an unsettling image of a knife. 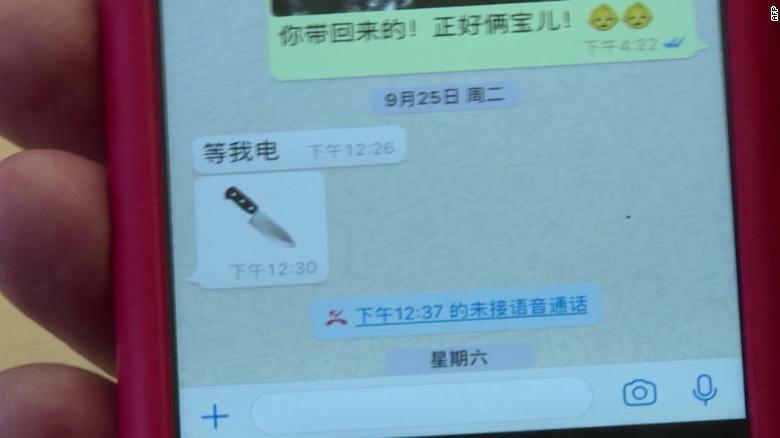 Many believe the knife emoji was a pre-arranged signal, and noted the couple’s preferred instant-messaging tool was WhatsApp, a platform long blocked in China but considered much more secure than Chinese apps. China-watchers also note Grace Meng is being strategic in what she chose to include — and to leave out — of her statements. While she has rejected the government’s accusation of corruption against her husband and poignantly called “anti-corruption” a “tainted” term in China, she has refrained from naming President Xi Jinping, whose anti-graft dragnet has caught more than a million officials since he took power in late 2001. Critics have long called Xi’s massive campaign an effort to eliminate political rivals and consolidate power. Xi is now considered the most powerful Chinese leader in decades — and could rule China indefinitely after the country’s rubber-stamp parliament removed presidential term limits earlier this year. Grace Meng has also stressed her husband was “in good shape” before leaving France, depicting him as an avid swimmer and runner who received a clean bill of health in a recent physical exam. Without using the word “torture,” these remarks are clearly aimed at Chinese anti-graft investigators, who are known to deploy harsh tactics during lengthy interrogations and linked to numerous suspicious deaths of officials in custody. 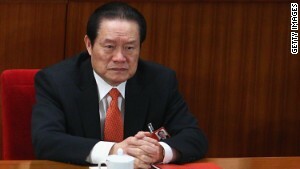 The official Chinese announcement of Meng Hongwei’s detention mentioned disgraced domestic security czar Zhou Yongkang, and many analysts see it as a sign of possible connections between the two — even though Meng Hongwei continued to rise through the ranks after the downfall of Zhou, who received a life sentence in 2015 for corruption and abuse of power. Chinese state media have highlighted Meng Hongwei’s past position as the head of China’s counterterrorism office and implied his detention could be related to national security. Some analysts have raised the case of a Uyghur activist as a possible connection. In February, under Meng Hongwei’s watch, Interpol upset the Chinese government by lifting a longstanding wanted alert on Dolkun Isa, a prominent Uyghur dissident who was granted asylum in Germany but still considered a terrorist by Beijing. Since Xi came to power, China’s increasingly harsh treatment of the Uyghurs — a Turkic-speaking, largely Muslim minority group in China’s restive far west — has come under growing international scrutiny. While the true reason for Meng Hongwei’s sudden detention may remain a mystery for a long time, his dramatic fall from grace in front of a global audience has only reinforced notions long held by Beijing’s critics: No one is safe in Xi’s China anymore — and Chinese authorities are perfectly willing to flout any rules or norms to demonstrate their absolute loyalty to Xi, international incident or not. Such an assessment could in turn underscore concerns over China’s expanding influence in multinational organizations, especially the “Sinofication” of these groups if they are led by Chinese government officials — notwithstanding their own volatile political fortunes as shown in the Interpol example. Grace Meng’s surprising reactions to her husband’s disappearance, though, may have shed light on a counter current. As many in China’s ruling elite feel increasingly insecure under Xi, observers say, they may no longer be resigned to becoming sitting ducks, but have instead adopted increasingly sophisticated contingency plans that often count on Western governments and media — the very institutions that they have long publicly denounced or ridiculed. Even before the latest saga, several notable precedents existed. In 2012, a police chief in the southwestern metropolis of Chongqing traveled to a US consulate and sought to meet with American officials, triggering one of the biggest political scandals in recent history involving murder, corruption and betrayal. The incident eventually destroyed the future of Xi’s then-archrival, paving the way for his ascent to the top. Grace Meng’s actions in France have undoubtedly forced the Chinese government to release information — however limited — on her husband much sooner than they had planned, considering many detainees vanish for months or longer.